Is Your Safety Incentive Program Proactive & Behavior-Based? A comprehensive safety program is like a pie with many pieces. Eliminate any one piece, and the pie is incomplete. Creating a proactive, behavior-based safety incentive program brings a higher level of awareness to existing safety programs by providing a holistic approach. The following checklist will help you determine if your safety incentive program is up to par to meet regulatory compliance guidelines (OSHA). 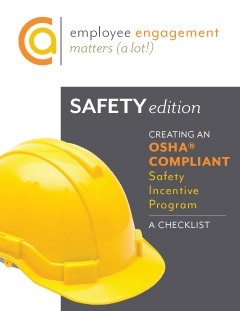 “By working cooperatively, OSHA and its VPP partners can demonstrate that good incentive programs, which emphasize positive worker involvement in safety and health activities and conscientious hazard reporting and correction, can be one element in an effective injury and illness prevention program." To receive your complimentary checklist, simply fill out the form on this page.